Designed especially for shellac records, this design offers excellent sound clarity and long-lasting performance for your favourite records alongside a durable construction. Earn 150 loyalty points when you order this item. Audio Technica AT-Mono3/SP MC Phono Cartridge is a moving coil phono cartridge designed to support shellac records. Wound with PCOCC coil, it offers a pure and clear sound that will bring your shellac records to life. Its high output of 1.2mV means it can be used without additional pre-amplification or an MC transformer. 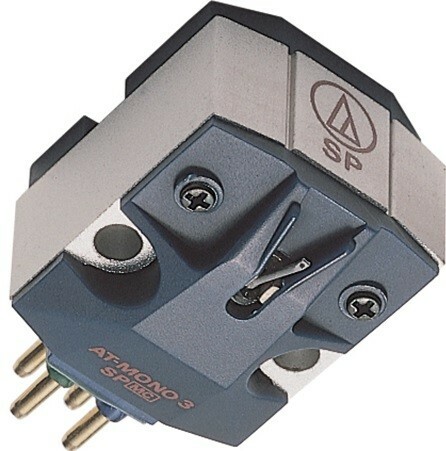 If you are looking for a moving coil cartridge for LP records, check out the Audio Technica AT-Mono3/LP MC Phono Cartridge. The cartridge only generates signal with horizontal movement, so it is designed and crafted especially for your beloved mono recordings. Alongside this, the AT-MONO3/SP additionally features an adapted vertical compliance in order to reduce wear on the groove. With an average usage time of 500 hours, you can be assured of an extended life span of timeless mono recordings. A rigid synthetic resin holds the body of the design to achieve optimum stiffness, while the body is also crafted from a solid die-cast aluminium alloy to protect the model's internal mechanism.